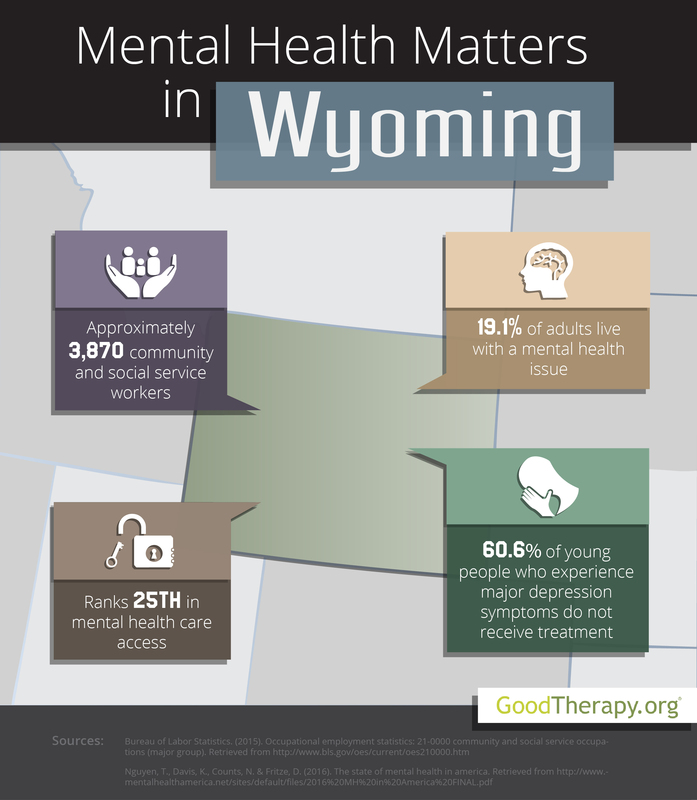 Find a therapist in Wyoming with GoodTherapy.org. Wyoming had 586,107 people living in the state 2015. Of those residents, 92.7% were white, 1.4% were black, 2.7% were American Indian and Alaskan Native, and 1% were Asian. Residents 65 years or older make up 14.5% of the population, while minors make up 23.7%. Roughly 49% of all residents are female. Federal employment records show 3,870 residents had occupations involving social service and community health. Examples of jobs within this employment segment include working as a probation officer, an addiction counselor, or nurse at a residential treatment center. In Wyoming, these professionals earn an an average yearly salary of $45,960. Wyoming was ranked a mid-range 29th in overall mental health conditions after being evaluated by Mental Health America (MHA) in 2016. Additionally, the state finished 34th in adult mental health ranking, 38th in youth mental health ranking, 25th in access to mental health care, and 46th in prevalence of adverse mental and behavioral conditions. Analysts from Mental Health America have identified a possible relationship between the state’s low prevalence ranking and high rates of homelessness in Wyoming. The 2016 MHA survey reveals substance abuse and substance dependence are among the most pressing concerns for therapists in Wyoming. These issues affect almost 10% of adults and 6.7% of young people in the state. Wyoming placed 46th and 47th in these respective health care categories. Supporting evidence is found in a behavioral health report published in 2014 by the Substance Abuse and Mental Health Services Administration (SAMHSA). In that report, SAMHSA claims a higher percentage of young people in Wyoming smoke cigarettes, engage in binge alcohol use, and show dependence on alcohol than in the nation as a whole. Residents with addictive behaviors to alcohol, illicit drugs, or other substances are encouraged to find a therapist in Wyoming who may provide needed mental health services. According to SAMHSA, 69.6% of adults in the state report functioning better after receiving treatment from public mental health services, which indicates many conditions may be treatable. This is comparable to the 70% of adults who also report benefits from therapy across the nation.